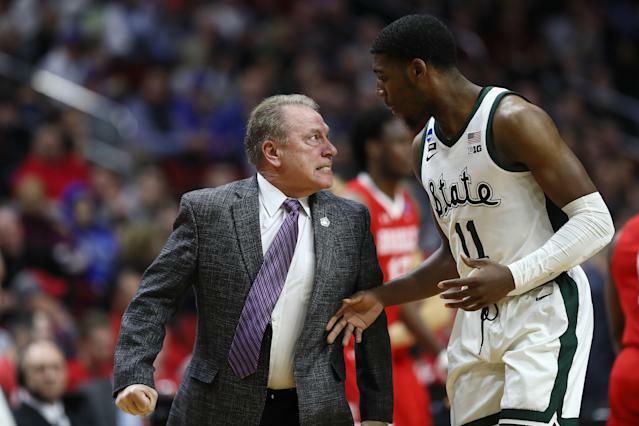 Tom Izzo has been screaming at his players for nearly a quarter century now, and that's just as the head coach of the Michigan State Spartans (he was no less fiery as an assistant). He grows into a ball of rage on the sideline. He stomps his feet. He gets into their faces. "I'm a tell-it-like-it-is guy," Izzo said Thursday following MSU’s 76-65 NCAA tournament victory over Bradley. He is. He always has been. The 64-year-old practices an aggressive, old-school brand of coaching, where everything is about pushing limits, physically and mentally. It has worked to the tune of not just a national title or seven Final Four appearances, but a parade of players in the NBA and/or graduating from college. Along the way there are going to be some heated verbal barrages. A lot of them, really. On Thursday, it was freshman Aaron Henry's turn. During a tense second half, Izzo nearly blew a gasket at what the coach determined was less-than-satisfactory effort and play. Izzo pointed at Henry. Izzo shouted at Henry. Izzo would have continued, but on two occasions other Spartan players got in the middle, most notably team leader Cassius Winston. "It's nothing new," Henry told the Detroit News. Well, maybe it was new to some of the national television audience. 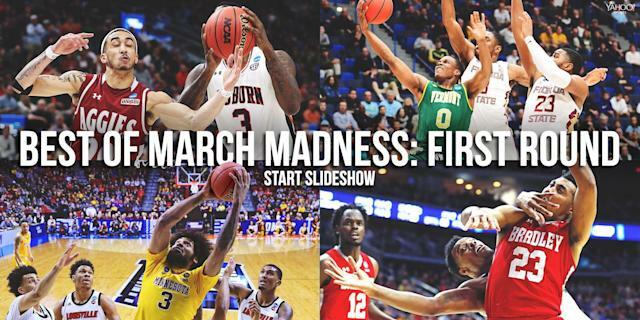 This being the NCAA tournament, Izzo's outburst drew far more attention than a similar deal on some February night in the Big Ten. Clips were all over social media. Content was aggregated. The postgame news conference featured multiple questions about it, including asking Izzo what it was that Henry did that him so angry. "You think there was one thing that would make me that angry, you don't know me very well," Izzo said. "There was a bunch of things, you know, and, hey, he's playing a lot of minutes, too. He's tired, too. When you are a freshman now at this time of year, you don't make mental mistakes on things we're telling a guy which way he goes or not running back. "There are some things Aaron didn't do a very good job of and yet, you know what? I did get after him and he did respond and he did make a couple of big buckets and he did make a couple of big free throws, but that's not good enough. This is one-and-done time. The 'my-bads' are out the window. If it's my fault because that guy played better and it's my bad because I walked back and didn't sprint back, then it is your bad and you're going to hear about it." Classic Izzo, an explanation that bounced back and forth from praise to demands. He asks for a lot from his players. Yet he asks a lot from himself. "These guys probably did a better job than I did," Izzo said in his opening statement, before discussing how they are naturally fatigued after a long run through the Big Ten tournament. "... I'm proud of them. I am." This is what attracts players to play for Izzo. This is it. It's been working for decades now and it would be a shame if it ever changed. Everyone knows exactly what they are getting by joining the program — and sometimes that means a lot of shouting and pushing and craziness on the bench. At the same time, there is also a coach who builds them up, stands by them and tries to get the most out of them. It's a two-way street. The shouting was no big deal to the team. Winston, the team's junior point guard, saw Izzo berating at Henry and asked Izzo to tell him what the coach was trying to convey to Henry. Then Winston went and demanded it of Henry — peer to peer. Izzo was smart enough to let him. "I just felt at that moment, I could get the message to him better than coach," Winston told Jeff Seidel of the Detroit Free Press. "I know what it's like to be in his shoes. So much is going through his head." How could that be a bad thing? "I get a kick out of you guys," Izzo said to reporters. "[You] get after somebody because you're trying to hold them accountable. I don't know what kind of business you're in, because if I was head of a newspaper and you didn't do your job, you would be held accountable. That's the way it is." Henry didn't play particularly well Thursday, either before or after the "coaching." Yet he didn't sound troubled by anything after. Rather than flair up at his coach, he looked inward. This is, indeed, one-and-done time. This is MSU in the NCAA tournament. Players go there to make Final Fours and that doesn't happen with just pats on the back. "It's just responding to it, accepting the coaching, not having a pity party for yourself," Henry said. "Just being a basketball player and go respond." That's all the coach is asking. That's how this program works. And that's exactly what Aaron Henry gladly signed up for, the grind and glory, all wrapped into one.